Design of pattern recognition system aims at providing two outcomes, namely the algorithm capable of performing decisions for new observations and the estimate of its performance. The classification performance may be reliable estimated only using the data unseen during training. In order to maximally leverage the limited amount of labeled examples available in most projects, perClass offers easy-to-use tools to perform sophisticated cross-validation strategies. In the data a there are 496 apples, of which 66 are wrongly classified as 'banana', while 430 are correctly classified as 'apple'. 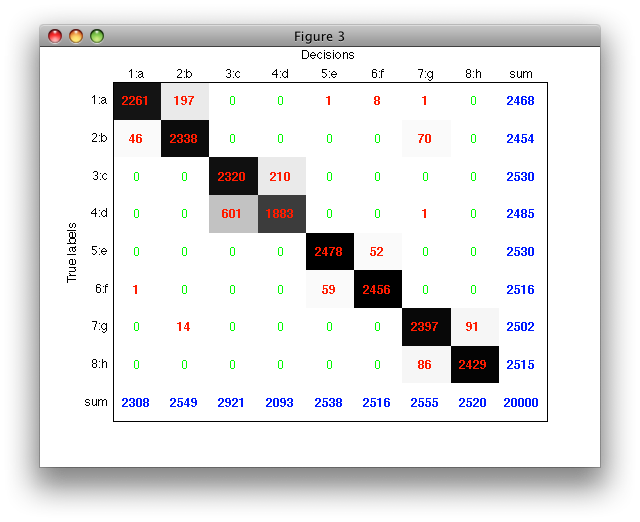 With 'figure' option, confusion matrix is visualized in a separate figure. Each matrix entry is rendered with a proportional gray-level allowing us to quickly spot the most important error patterns. The row and column sums allow us to quickly compute useful error measures such as detection rates (dividing by the row sum) or precision (dividing by the column sum, i.e. number of samples assigned in a specific class). If an index (handle) of an existing figure is provided after the 'figure' option, sdconfmat renders the confusion matrix into this figure instead of opening a new one. The confusion matrices from classifier soft output can be estimated for sets of operating points simultaneously. In this example, a test set with 10 000 samples is used and the confusion matrices are estimated at 10 000 randomly selected weighting-based operating points. The speed of the computation is also shown. Elapsed time is 2.178765 seconds. The variable cm stores a confusion matrix (which has size 8*8 for a eight class problem) for each of the 10000 operating points. 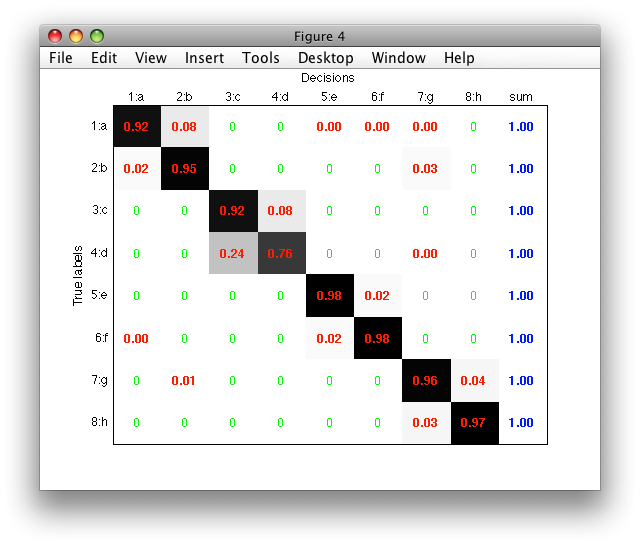 The sdconfmat routine can also be used for a friendly visualization of a single confusion matrix, e.g. the one at operating point number 42. In order to inspect which samples are misclassified in a certain class it may be useful to visualize the errors of the confusion matrix. This can be achieved by creating a new sample property that combines the true labels with the decisions of the classifier. 1 Mixture of Gaussians    2x3  10 components, full cov.mat. In the Scatter menu go to Use labels and select confmat. Cross-validation is an evaluation strategy where the available design data set is split into several parts. One part is left out and the algorithm is trained on the remaining parts. The trained algorithm is executed on the part left out, and its decisions are used to compute the classification error. In perClass, this form of cross-validation is called 'rotation' because the definition of a test set rotates over parts and each sample is tested only once. The 10-fold cross-validation was performed using the default operating point weighting both classes equally (equal class priors). Note that the cross-validated algorithm must return decisions, not soft outputs. The 'class-errors' yields per-class error rates. Note that some measures, such as sensitivity or specificity require definition of the target class. For the list of the available performance measures see the ROC chapter. The number of cross-validation folds may be changed using the 'folds' option. Maximum number of folds in randomization method is limited by the number of samples in the smallest class. sdcrossval requires that each class in the test set maps to a classifier decision. If a test set class does not have its counterpart in the list of decisions, the corresponding error cannot be computed and sdcrossval raises an error. This may happen, for example, when training a detector. Lets assume a two-class problem with 'apple' and 'banana' classes. Warning: Some test set classes do not match to classifier decisions. 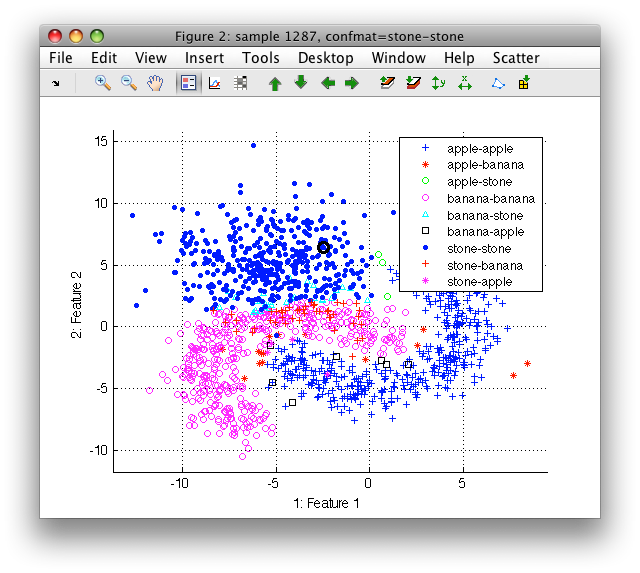 The error is raised because the trained detector has apple and non-apple decisions while The banana class in the test set does not map to any decision. Note that the opposite situation is possible. Often, some of the classifier decisions do not map to any class present in the test set. Such situation appears, for example, in leave-one-out cross-validation where the single test object belongs to one class only or when evaluating classifiers with reject option. The optional third output of sdcrossval is an object that provides us with access to algorithms trained in each fold. The evaluation obeject e also allows us to access training or test set of any fold. perClass also provides 'randomization' type of cross-validation where training/test splits are constructed by random sampling of the total set. By default, 50% of samples in each class is taken randomly in each fold. Number of cross-valiadation folds in randomization is not limited. The last option is useful when we want to cross-validate a detector trained in a one-class fashion (only on examples of a specific class). Note that we specify the non-target name explicitly. If we did not do it, the default non-target decision ('non-banana') would not match with any true class and all non-target detections would be counted as errors. We are also providing the vector parameter [0 50] of 'method','random' in the order of classes in b.lab.list (banana is second). sdcrossval also supports the leave-one-out cross-valiation scheme where each sample is once considered as a test set and training is performed on remaining samples. Leave-one-out evaluation is beneficial for very small sample sizes. By default, leave-one-out evaluation includes class error measures. Note that because each of our samples originates from one of the classes, the error on the other class is not defined. Frequently used type of leave-one-out is cross-validation over specific labels, for example over patients or objects. This allows us to quickly valiate generalization error on unseen patient or object. We may use the example small_medical data set that contains data samples originating from a medical diagnostic problem. For each sample, we know not only class and tissue type but also patient label.